Survey of Fort Hill by E.G. Squier. Fort Hill is a Native American fortification built by the Hopewell Indians nearly 2,000 years ago, and is one of the best preserved Indian structures in North America. It was built atop a natural hill and towers nearly 500 ft above the forest floor. It was first described in 1838 by Ephraim George Squier. Squier described it as being nearly 1.5 miles in length and encompassing approximately 48 acres. A ditch is located on the inner side of the earthen wall. From the bottom of the ditch to the top of the embankment it measures approximately 15 ft and may have been much taller in the time of the Hopewell. Around the wall are 33 gateways about 15-20 ft in width. The purpose of these gateways is somewhat unclear though it is obvious that they were not used as exits or entrances. They may have been used to release water which would otherwise accumulate in the ditch, or towers may have been built which have since rotted away. Evidence of at least two ceremonial buildings and possibly a small village have been found. Certain areas in the interior of the site were obviously built to hold stores of water. Ditch and embankment along the edge of the fortification. Fort Hill was again studied in 1952 by Raymond Baby. His study resulted in the finding of several fire pits, the remains of several buildings, and many Hopewell artifacts. Among the artifacts found was an obsidian knife or spear point. 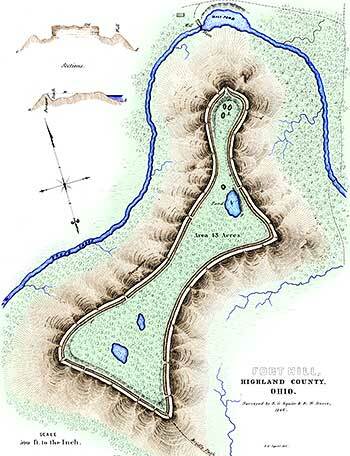 Obsidian is not found in the area of Fort Hill and it remains a mystery as to how the relic came to be at Fort Hill. "Considered in a military point of view, as a work of defense, it is well chosen, well guarded, and, with an adequate force, impregnable to any mode of attack practiced by a rude, or semi-civilized people. As a natural stronghold, it has few equals; and the degree of skill displayed and the amount of labor expended in constructing its artificial defenses, challenge our admiration, and excite our surprise." Both pictures cover exactly the same area of Fort Hill, a Native American fortified hill built by the Hopewell Indians nearly 2000 years ago. On the left is USGS Imagery in which all you can see is vegetation. On the right is LIDAR data processed by ScienceViews.com. 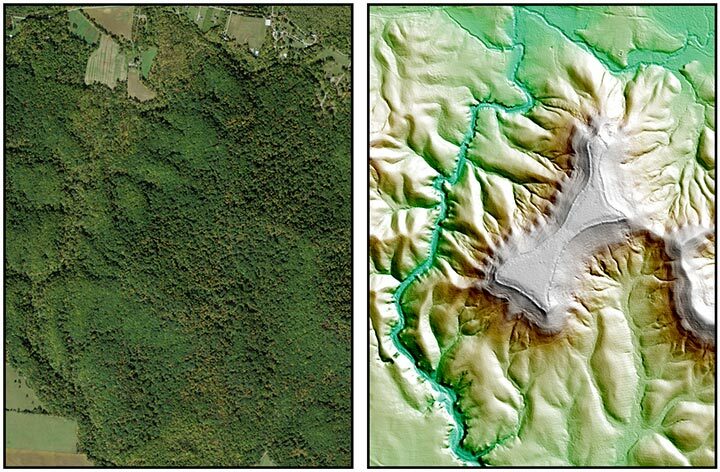 This data has been processed to see beneath the tree canopy, or the view of the ground. In LIDAR the earthen banks that once formed a palisade (fence) around the entire hilltop is very visible. Even the breaks in the walls where towers once stood are visible. Compare it to E.G. Squier's survey map of Fort Hill (SIA3594) completed in 1846. 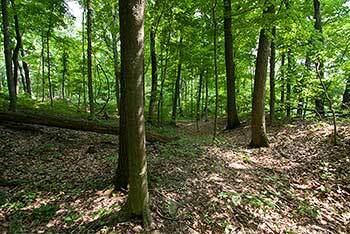 Fort Hill is now a State Park and contains over 11 miles of hiking trails, a museum, and recreational picnic areas. 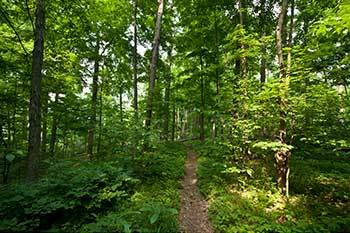 It is located off the State Route 41, on State Park Township Road 256, Ohio.